Upon arrival at a mental institution, a brash rebel rallies the patients together to take on the oppressive Nurse Ratched, a woman more a dictator than a nurse. McMurphy has a criminal past and has once again gotten himself into trouble with the law. 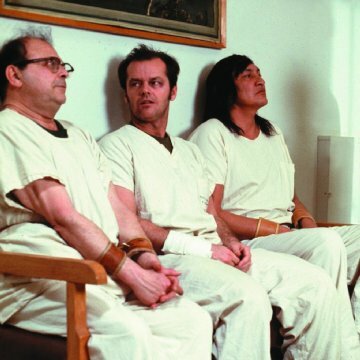 To escape labor duties in prison, McMurphy pleads insanity and is sent to a ward for the mentally unstable. Once here, McMurphy both endures and stands witness to the abuse and degradation of the oppressive Nurse Ratched, who gains superiority and power through the flaws of the other inmates. McMurphy and the other inmates band together to make a rebellious stance against the atrocious Nurse. Taglines: If he's crazy, what does that make you? 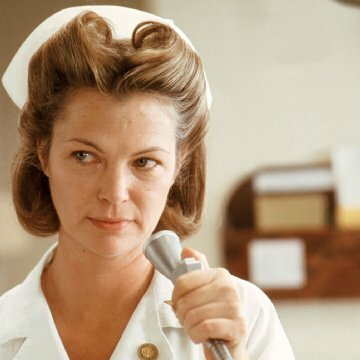 Colleen Dewhurst, Geraldine Page, Anne Bancroft, Ellen Burstyn, Jane Fonda, and Angela Lansbury were all offered the role of Nurse Ratched. 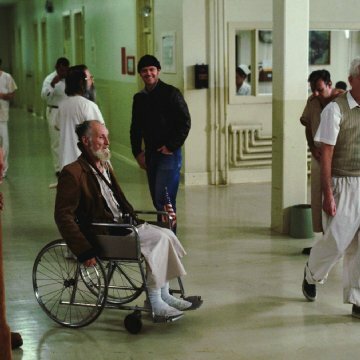 Errors made by characters (possibly deliberate errors by the filmmakers): After the voting for the change of the TV time, McMurphy tells Nurse Ratched at one moment that the voting was ten to nine, while it was actually ten to eight, like he said before. 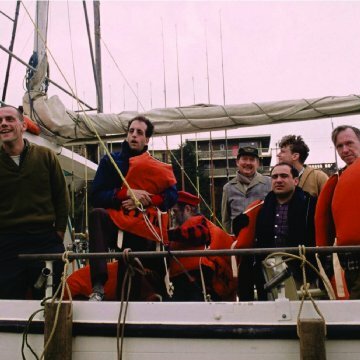 I went into this film with the knowledge that it had been the second film in history to win the 'top five' Oscars (for Best Picture, Best actor, Best actress, Best director and best screenplay) and has been praised as "one of Jack Nicholson's finest roles" and "one of the classics of the 70's". Naturally, after hearing all this, I had high expectations for One Flew over the Cuckoo's Nest. But nonetheless, I was surprised at how easily the film surpassed my expectations and easily led me to understand how it merited all that praise. 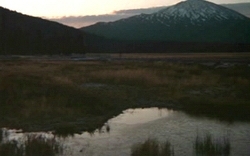 Based on the novel by Ken Kesey, the story follows Randle Patrick McMurphy (Jack Nicholson), who, in an attempt to get out of spending more time in prison, pleads insanity for his crime, and is therefore sentenced to time in a mental institution. This was McMurphy's intention, as he believes the conditions in a "crazy house" will be significantly easier to contend with than another harsh stay in prison. However, he quickly finds out that surviving the institution with it's desolate patients (including Christopher Lloyd, Danny DeVito, Vincent Schiavelli and an absolutely brilliant Brad Dourif as the stuttering Billy Bibbit) and the monstrously repressive Nurse Ratchet (Louise Fletcher, in a career defining role) is considerably harder than he imagined. McMurphy plays pranks, horseplay, and is generally defiant to the rules of the institution in an attempt to raise spirits. His constant optimism and reckless defiance to the out of date rules in the institution can be very uplifting, and often quite funny as well, but much of the movie can be very depressing - the generally decrepit state of the institution is a consistently (and intentionally) bleak background to a superb story with a truly bittersweet ending. Jack Nicholson is at his best here, head and shoulders above other excellent performances such as in 'Chinatown' or 'As Good as it Gets'. McMurphy is an apparently unquenchable optimist, refusing to succumb to the defeated spirit of all the other patients. His livewire antics, inspiring the patients are generally uplifting, and when his indomitable spirit is finally broken, we really feel for him and his fellow patients. Nicholson conveys the essence of McMurphy to perfection, demonstrating his excellent understanding and interpretation of the character. When McMurphy announces that he is going to lift a huge stone fountain and hurl it through the window to escape, the other patients are so caught up in his intoxicating spirit of freedom that they honestly believe he can do it, despite the fact it would be impossible for a man much stronger than him. 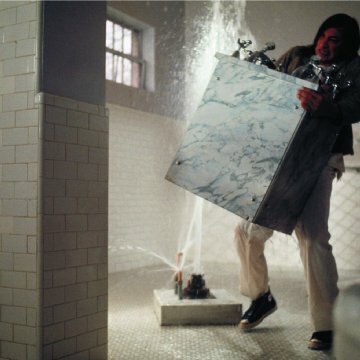 When McMurphy finally discovers that despite his best efforts, he cannot lift the fountain, he is so openly crushed that we can't help but feel for him. Beneath the frequent profanities and livewire antics, there are real human emotions, which come across as truly touching. What can be said about One Flew over the Cuckoo's Nest which hasn't already been said? It has an excellent storyline, top notch acting, painfully bleak visuals, perfectly setting the tone for the movie, and alternates between being truly uplifting to devastatingly depressing. It features perhaps the most memorable film ending ever, next to a man on his horse riding off into the sunset, and leaves the viewer beaten down by the conflicting emotions, unaware what to think of the picture next to reveling in it's glorious entirety. It's hard to produce a final outcome any better than this.